What do Millennials think about big tech brands? There are two important facts about the Millennial Generation (those born between 1980 and 2000). Millennials will outpace every other generation in spending power by 2018. The Millennial Generation will also wield significant political sway as they become the largest voting bloc in the United States. That is why what the Millennial Generation thinks matters. With recent headlines highlighting scandal and potential regulatory challenges for tech giants, just what are Millennials thinking? In Part 1 of our survey, we ask Millennials about their attitudes toward online privacy, trust in data security and overall sentiment toward selected companies. Four tech companies stand out in terms of reported usage: Facebook, Amazon, Google and Snapchat. Roughly 75% of respondents reported that online privacy is "very important to them." 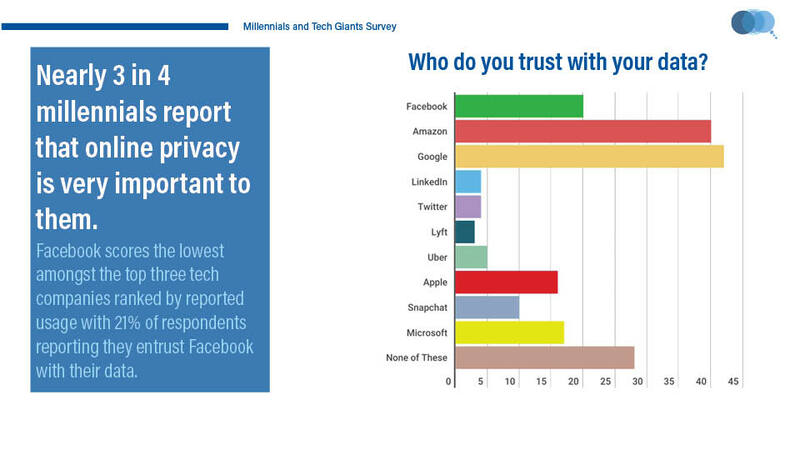 Facebook performs the worst out of the top three tech companies (in terms of usage according to our survey). Predictably, those who hadn't used a product or service in the past month, gave those products or services lower marks. What is notable is the difference in perception between users and nonusers of the various tech companies we tested. When it comes to trust, familiarity matters. For example, roughly 10% of overall respondents reported that they trust Snapchat with their data, but amongst users performed better, with 44% of users reporting that they trust the disappearing messaging app with their data. By contrast, roughly 25% of users who reported not having used Google or Facebook in the past month indicated that they trust each platform with their data. We also asked respondents to identify, in open-ended responses, what they believe tech companies use their data for. Based on word usage, it appears that Millennials do have a basic grasp of the usage. Among the words most frequently used were ads/advertising, know, data, sell and marketing. Generally, Millennials have positive feelings toward the tech companies we surveyed, with Amazon earning the highest marks and Twitter the lowest. All companies surveyed are net positive. Reputation matters. As Millennials come fully realize their purchasing and political power, their perception of tech brands (and all brands) will matter. For the tech giants, it's a mixed bag. For investors and executives, understanding what shapes trust and reputation is key. In part 2 of our survey, we look at Millennial perceptions for tech brands' role in society and regulation of tech brands. Publitics surveyed 400 U.S. Millennials through online opt-in surveys. Care was taken to ensure that the sample was demographically balanced.